1) The magic reflective vest – about $7 or $8. In March of 2012, I got an orange reflective vest for $6.39. I had no idea what I was getting into. Immediately, people starting giving me more respect. For the most part, people stopped pulling out in front of me and also stopped tail-gating. I have seen many drivers start to change lanes, and then they see me and do not make the lane change. You should consider wearing a light-colored vest (yellow, orange, or green) when you ride a motorcycle. I do a few more things that can make drivers notice me better: I wear a white helmet, and I have a white front license plate (black letters) and two front auxiliary driving lights (white, but yellow is better). Two very important ways to avoid collisions on a bike is to increase your following distance and wear a reflective vest. 2) The weak rear brake on the Virago 250 is actually a safety feature (“poor man’s ABS”). I have never locked up the rear brake on the XV250, but on my other bike I have locked up the rear brake (and sliding/fishtailing) several times in emergency stops on I95. In most motorcycle accidents, the front brake is applied too lightly and the rear brake is applied too hard. If you have a Virago 250, practice using the front brake more effectively. 3) On low-powered bikes like the Virago 250, weight reduction makes a big difference in increased performance (improved acceleration and reduce stopping distances), especially with wheels and tires which reduce rotating weight and unsprung weight. I took some seats out of my car this year (weight 90 lbs – I noticed a huge difference in low speed acceleration and hill-climbing ability), and my wife had to yell at me for a month until I put them back in. b) turn them on for only a few seconds when you see a car looking to go into your lane, and then immediately turn them off. 5) It is easy to grease wheel bearings yourself. This works for my bike, but your bike might be different. 1) Carefully remove the rubber grease seals with a small screwdriver. 2b) With grease seal removed, remove the old grease from the metal bearing cover. The cover has holes, so you can use the rubber grease seal to force fresh grease through these holes into the bearings. Put fresh grease on the metal bearing cover, then carefully push the rubber grease seal to make a little hydraulic pressure which will force the grease through the holes. Do it maybe 3 or 4 times until you see grease coming out the other side. 6) “Partially expose front sprocket” by removing lower part of front sprocket cover. 1) You can remove the front sprocket or chain without having to remove the front sprocket cover. 2) You can polish the front sprocket and you can keep that area clean. On the bikes that I have owned, that area always has lots of dirt and grease. 3) You get the more mechanical “look” of having an exposed front sprocket, but with some safety since the top part is retained. 7) If your air filter has a foam element, use only real air filter oil. (I used olive oil and the wind blew it all over me and the bike.) You can lose a lot of power and your air filter won’t even look dirty – so clean or replace it once a year. 8) The voltage regulator runs too hot on some Virago 250’s – I measured the temperatures on mine and listed some of them below. Basically, mine stays cool if the bike is moving, but gets too hot in stop-and-go traffic or idling. Hope you have a very good year in 2013 – Les S.
PS Just found this today. 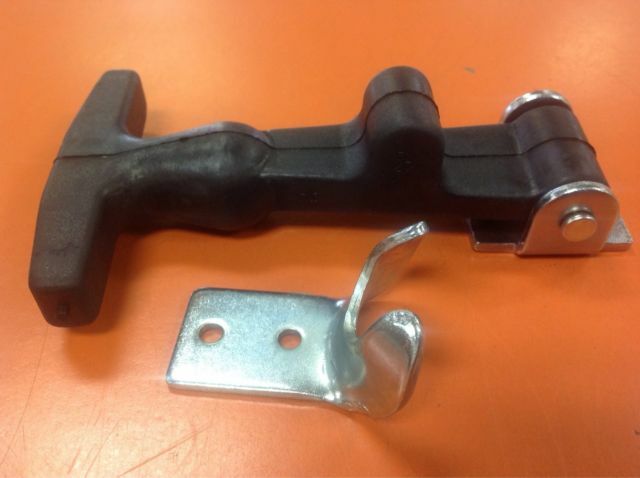 Rubber hood latch – it is normally used for semi trucks but it looks like it could be used for something on a motorycle. I’m just trying to figure out for what. This entry was posted in Motorcycles and tagged Motorcycle safety, Virago 250, Virago 250 mods, Virago safety. Bookmark the permalink.